A big change was, when we could communicate with this computer via teletypes. They were similar to typewriters and allowed a direct connection to the computer, which is significantly speeded up the work. Huge fight was to use these teletypes, 1-2 days in advance we had to book a time. 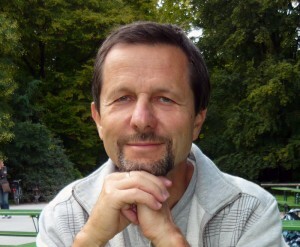 I taught at Mathematical Institute of the Eötvös Loránd University, when the school-computer program started in our country. HT 1080Z school computers were distributed to the high schools. 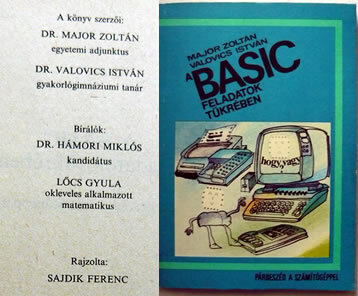 We managed to obtain one school computer, learned how to use it specially in the schools and we wrote a book with my colleague about the BASIC programming language and its usage, which was published by National Schoolbook Publisher. A few years later I wrote another book about the Izoperimetric Problem. I wrote it completely print-edited state on a Macintosh IIsi computer. This book was issued in private. It is now recommended in teacher training on the Szeged University. 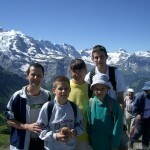 For more information check the math topic of this blog. Note: at 2013 it was published electronic version of the book (English and Hungarian). Next few years as an regional mathematics expert in the north-west region of Hungary (Komárom-Esztergom county, Győr-Moson-Sopron county and Vas county) I organized conferences, competitions and we built an informational database for teachers. I started to get to know the Internet at the mid of the 90s years in the Geodetic and Geophysical Research Institute in Sopron. I started to look around on the Internet about homepage and server matter. A few weeks later I started the first apache web server (on Unix operating system) and the Homepage of the Institute. 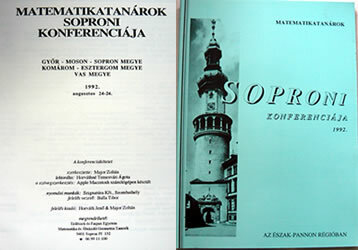 Since we lived in Sopron and the Internet at the time was only in the university and in our institute, I made a few pages about Sopron, and a guestbook in it as well. I was surprised, when I returned from a holiday after two weeks, and a number of entries found in the guestbook: “Hi, good that Sopron is also online!”, “Put up more photos” and similar ones. From various parts of the world’s people are found on these pages ( America, Germany, Australia … ). I went to the Mayor’s office to help to obtain images and other information about the city. Initially, they looked to me as a stranger came from the Mars, because the Internet was completely unknown to them. But I can say they were helpful. One year later we formed the Internet Sopron Association and the Homepage URL changed to www.sopron.hu (it was an apache server on Linux operating system). So Sopron was among the first cities in Hungary that were on the Internet and the next years 35-40 people worked on this site. From the end of 90s years we started a little company to develop Japanese-language Web sites, particularly in Europe guide. Initially, were a lot of problems to display the Japanese-language text correctly. Before unicode to show Japanese characters was more art than science. At the first time our server was in Sopron, but the U.S. servers later improved reliability and better accessibility, since the vast majority of visitors arrived from Japan. It was interesting to organize and monitor the servers in the U.S. from Sopron.